It's nice to know that not all the music coming out of Italy is some form of power metal or sleaze/glam rock. 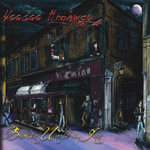 Voodoo Highway offer vintage hard rock, akin to the mid 70's to early 80's, with big riffs, a rumbling rhythm section, and a healthy splash of Hammond organ. But don't expect some classic rock redux as their debut album Broken Uncle's Inn lively and refreshing. Broken Uncle's Inn erupts with hard rock with fast paced Till It Bleeds. The Fire Will Burn Away gives us our first glimpse of the old school organ, but also offers a solid melody and fine guitar work throughout (something typical in every song). JC Superf*ck my have the catchiest chorus of the lot, even though it's obviously vulgar. The song is made better by a fine drum segue about two and a half minutes. The organ revs up the old school rock flair even more in Windows, where organ and guitar solo in duet, and the fast rocker Running Around. The title track, however, finds the Hammond swirling and stirring the hard rock brew. Though the song seems heavier, it's likely the most interesting of all. There's a surprise breakdown at three minutes with strings and some strange organ. This then erupts into a Zeppelin-like segment with a deep bass line, big riffs, and harmonica. Quite satisfying over all. The album rounds out with the ballad Heaven with No Stars, mostly vocals, piano, guitar over a string arrangement. It's nice, but sounds over-polished, and not in keeping with gritty nature of the rest of the album. Of the final two rockers, In Fact It's the Worst is the best, with a smoking hot groove, catchy chorus, and classy guitar solo over a sweaty and simmering organ layer. While likely not to please fans of modern rock trends, Voodoo Highway, on Broken Uncle's Inn offers a fresh re-imagining of the Seventies hard rock sound, complete with a whirling Hammond, that may require finding some paisley shirts and bell bottom pants. Recommended. While likely not to please fans of modern rock trends, Voodoo Highway, on Uncle Broken's Inn offers a fresh re-imagining of the Seventies hard rock sound, complete with a whirling Hammond, that may require finding some paisley shirts and bell bottom pants.